​QUEENSLAND COMPETITION CARRIAGE DRIVING INC.
On 25 July 2017 Queensland Competition Carriage Driving Inc. became the new name for Warwick & District Carriage Driving Club ( formed in 2001) which was originally Fassifern Harness Club when incorporated. Our main focus is Combined Driving Events (CDEs)- the driving equivalent of three day eventing- in an exciting three stage competition at all levels. Competition A - Dressage, Competition B- Cross Country or Marathon and Competition C - Obstacle or Cone Driving. Our club has been holding CDE’s for over ten years and has hosted several State Championship events. In recent years 1* format events in Dressage and Cones and Combined Marathon have proved very popular. The club also runs Workshops and Training and Come and Try Days throughout the year. Horses of all sizes attend these events, from miniature horses smaller than 10hh through to large horses over 16hh. We are affiliated with the Equestrian Australia. 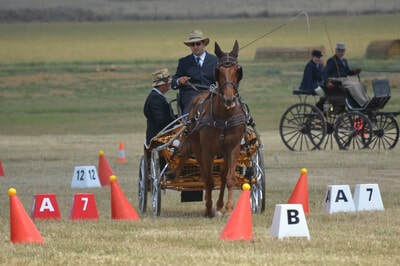 The Carriage Driving season runs from March to October each year and the club endeavours to run a range of activities and competitions to improve, showcase and test the skills of carriage drivers and their horses at club, state and national level. Most of our events are held on the Darling Downs.